It is proved that essential oils of citrus fruits are able to rid the skin of unsightly tubercles. Orange oil against cellulite has found the most extensive use in cosmetology. Orange oil has a whole range of beneficial properties for our body. When applied to the skin, it enhances the metabolism, improves carbohydrate-fat metabolism, which promotes the rapid breakdown of fats. The skin becomes taut, smooth and supple. At the same time, we receive simultaneously a session of aromatherapy, which will save us from depression and raise our spirits. 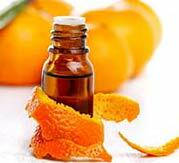 Orange oil is often used as a massage for anti-cellulite massage. To do this, it is enough to apply a few drops of oil on the palm of your hand, and then rub the problem areas for 15 minutes. To enhance the effect of massage, you can use various massage accessories: mittens, massage jars, brushes, massagers, etc. After the massage, do not take a shower, so that the oil will affect the skin for a long time. It is very effective to use for anti-cellulite massages a mixture of orange oil with oil of geranium, cypress, rosemary, juniper, etc. Do not be frightened if during the procedure you feel a slight tingling sensation on the skin. This is an indication that the oil is working efficiently in the right place. You can add orange oil in a massage cream, shower gel or lotion, and then apply it to the skin every time after showering. Note: orange oil enhances the effect of sunlight on the skin, so before going out to the street you need to treat the skin with sunscreen to protect yourself from burns. It is very effective to add orange oil when taking baths. This is the most pleasant way to fight cellulite. Warm aromatic bath will help dissolve excess fat, remove toxins and toxins, accelerate metabolism, improve and tighten skin, relieve stress. Baths are recommended to alternate with massage and wrapping procedures to achieve the desired result. How to make an anti-cellulite bath: Fill the bath with warm water. Dilute 10 drops of oil with your favorite bath foam and then add to water. If there is time and desire, lightly warm up with massage movements problematic places. Now you can enjoy the procedure for 15-20 minutes. To enhance the healing effect, dissolve in the bath a handful of sea salt. You immediately feel on yourself how the therapeutic components of the bath work: the skin will warm up, soften, there will be a slight burning sensation in places where excess fat has been deposited. You can take such baths 1-2 times a week. Anti-cellulite wraps are successfully used in the fight against cellulite both in beauty salons and at home. The easiest way to curative wraps is to apply orange oil to problem areas, warm the skin in circular motions, and then wrap the film for 15-20 minutes. Wraps of orange oil with honey. Mix 2 tablespoons of natural honey and 5 drops of orange oil. Apply to the skin, massage for 5 minutes, then wrap the film, then rinse and lie down for 20 minutes. Very powerful tool!